The prevailing truth around the Second World War was that only the SS were involved in the Holocaust and that no one else really knew about it. That truth has been questioned over the last few years and this book sheds even more light on this as well as other subjects about Nazi Germany and the war. British and US Intelligence thought it a jolly spiffing idea to bug their POW camps and record every day conversations of both high and low ranking German soldiers. The British recordings were also transcribed and those transcripts languished in archives until discovered by the authors of this book. The conversations ranged in topics but most of those collected here are based around things we would now consider abhorrent, such as anti-Semitism, genocide, and war crimes. What shocks the modern reader is not so much the topics being discussed in every day conversation but the tone and content of what is being discussed. 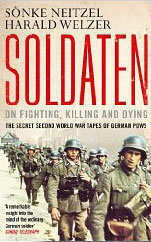 What is so surprising about this book is that it is clear that all branches of the German armed forces knew about and were involved in atrocities, and not only that but these things were for the most part treated as the norm. The authors have been careful to include all kinds of psychological explanation in order to put all of these transcripts and the views of the POW’s into context, that context being the changing society of Germany under the Nazi party. You have to remember that the average age of the combat soldier would’ve been around nineteen, n-n-n-n-nineteen, to twenty-five and therefore their whole adolescence would have been under National Socialism and its abhorrent prejudices, meaning that to them this was normal behaviour and their standards and points of reference for behaviour and views was completely different to what we might expect. This is an excellent book with only one flaw for me, and that is that there is nowhere near enough transcripts included. This book could’ve done with padding out more of what the POW’s actually said rather than all the analysis, which is really good nonetheless, I just felt in the end I was reading more about why things were being said then was actually said – and there is an abundance of material available. This book does two things. It proves beyond doubt that everyone in the Armed Forces knew what was going on as far as the Holocaust and war crimes were concerned, and may even have taken part in them. It also proves the oft-mentioned description of the likes of Hitler and Mengele as ‘the banality of evil’.